“It could happen to anyone. Maybe to the person who passes your house each day on the way to work or the man sitting across from you on the train. This time it happened to my ozeret. A very nice lady who has been coming to clean for me for years,” relates Yonit Hagoel-Karnieli, Director of Ezer Mizion’s Speech Generating Devices Lending Center. “She was telling me about her brother-in-law who had a sudden heart attack. The heart attack led to a stroke which resulted in almost complete paralysis. From being a beloved member of a family, an active community member, he became a nothing- a “vegetable”. My ozeret was so upset. It was as if they suddenly lost him except that there he was- breathing but not much more. He couldn’t move. He couldn’t speak. Still a member of the family but no longer part of them. There was nothing they could do. They had to accept it. The doctors recommended putting him into a skilled care nursing facility where he would be ‘taken care of’. They’d feed him. Keep him clean and warm. He could live like that for many years. And he did live there. For one a half years. The family visited often but it was really among themselves that they conversed. The visit to the patient was a sham. Like a child playing make-believe. They were getting used to things. To talking around Moti instead of to him. His movements were no more human than the machinery that surrounded him. A slight grunt here and there. The Moti they had known was gone. Oh, they could pretend when they wanted to that the bit of a sound emitted was in response to his wife’s funny story. But they all knew it wasn’t real…Or was it? The same strange grunt as to last week’s joke. An almost whispered hum upon hearing about the bank’s mistake in his wife’s account. It couldn’t be real… could it? ” My ozeret wanted my opinion. Was he comprehending their conversation? I decided to give it a try. I visited Moti Ayish armed with a large board. On one end was a picture of his daughter. On the other was a picture of his son. ‘Look at your daughter,’ I asked him. His eyes slowly turned. ‘Look at your son.’ His eyes moved to the other side of the board. Again. And again. I asked him a question and told him that if the answer is ‘no’ to close his eyes and if the answer is ‘yes’ to open his eyes and blink. He did. More questions. More answers. The real Moti was still there! Hidden under all that paralysis but still there. I gave the family exercises to do and brought them some devices to use from Ezer Mizion’s Lending Center that will enable communication using eye movement alone. After six months, he was in a rehab center and improving fast. Who can fathom the joy as he actually took part in conversations using a device called Click2Speak. The family laughed aloud when he told his wife to withdraw 2000 shekels from the bank. “What shall I use it for?” she asked. When a grandson was being annoying as per his job description as a child: “Stop annoying your mother,” clicked the hitherto ‘vegetable’ grandfather using nothing but his eye movement. “How are you?” asked his visitor one day. Ezer Mizion ‘picked up the ball’ and taught him a new skill- how to use a computer by moving his eyes. 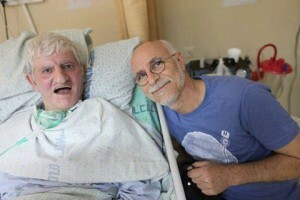 He was now able to connect to the world and was often found listening to his favorite singer, Yaakov Cohen. Along with the gales of laughter, Ayish’s relatives dabbed at their tears. Simcha, Moti’s wife said, “I haven’t seen him so happy since the stroke. Yonit and Debby ben-Tal, Ezer Mizion AAC Lending Center senior staff, have been invited to speak at the biennial ISAAC (International Society for Augmentative and Alternative Communication) international conference in Toronto, an event open to speech and communication specialists, medical professionals, and therapists from across the globe. As experts in the field and Ezer Mizion AAC Lending Center representatives, they will be presenting in two sessions: one will address burnout issues of therapists and caretakers in dealing with communication-challenged patients and solutions. The second session will discuss Ezer Mizion’s Click2Speak development project which is collaborating with Google to promote technological innovations that will make the world more accessible for people with disabilities. Ezer Mizion was chosen by Google for its part in developing the Click2speak on-screen eye-tracking virtual keyboard that will enable people with high cognitive function and limited mobility to communicate and control their environment. Ezer Mizion’s AAC (Augmentative and Alternative Communication) Device Lending Center services the speech impaired, both children and adults, in Israel.